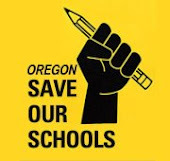 Oregon Save Our Schools is against high stakes testing. As one of the founders I am too. It debases education and abuses our children. But for now it is a massive part of education in Oregon and America. Here’s a little something we could do to lessen the impact and still keep its proponents happy. Let’s test children only every other year. We could divide the state’s school districts into even and odd year districts. Some districts would test in even years and some in odd years. For openers it would save about five million dollars at the state level alone. Lots of great stuff we could do with that money, like cutting class sizes or supporting school libraries or music programs. the testing factions would still be happy. The state bureaucrats and corporate pseudo educators would still have plenty of lower socio-economic schools to label “failing". The Oregonian could still write articles every year decrying the state of Oregon’s education. The suburban and urban mothers could still assure themselves their children are in the best labeled public schools. Stand for Children could still try to increase its Latino membership by telling Latino parents their kids aren’t that smart – heck, look at the tests. All Hands Raised and the builders of the OEIB dashboard would still have their data point markers to justify their work. Lots of data would still be floating around to be compromised by a longitudinal data base. Especially the teachers and kids who every other year would not have to put up with the ridiculousness.